Want something truly unique for your home? Our artisans can create custom paint and plaster finishes of all kinds! We’ve all seen the fad of heavy-handed faux finishes come and go. We prefer to specialize in custom finishes that pass the test of time. Possibilities range from classic traditional finishes such as gold or silver leaf, to metallic paints and plasters that are works of art in themselves. 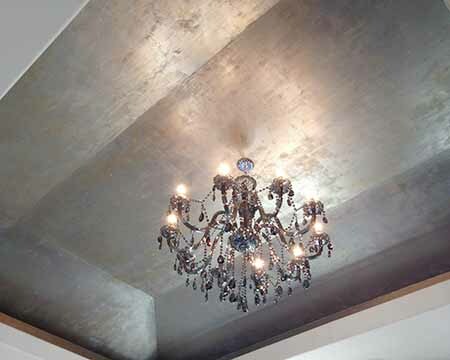 And we love the sophistication and authenticity of fine plaster finishes! See more of our unique, custom projects here. Custom glazed finishes can be applied to cabinetry as well. If you love the look of a subtle antiquing glaze on your cabinets, our craftsmen can give you a beautiful glaze on top of our sprayed cabinetry finishes! Have an inspiration photo for your project? We can collaborate to create virtually any finish. The sky’s the limit!